Sharing is caring… even for yourself! Sharing is popular. Everyone shares information with others – interesting facts & figures, funny stories, announcements, warnings, search requests and so on. Some people also share cars, flats, holiday homes, offices or even a pet. Others share food, knowledge, time, experiences etc. Sharing is a good thing – it makes us feel good. We can give something that others might need or appreciate a lot. 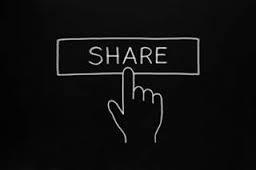 Sharing doesn’t necessarily mean we need to put a lot of time or effort into something. It can be a little thing for us that means a lot to another person. What a great concept! With all of us being extremely busy we feel it’s a good possibility to contribute to something without needing to spend too much time and effort. Doing good has become a common attitude of the civilized world. By being informed so well we are reminded again and again that we are living a very privileged life in our Western world. The result is that people increasingly feel the need to do good – for other people, for animals, for the environment or else. Also the young generation has the attitude of wanting to give something back. From different studies we can see that they are not only going for a big career and lots of money, but for work-life balance and the goal to make this world a better place again. So sharing is a great instrument for them to begin with! But there is another interesting aspect to it. It’s again something that can be observed with the new generation. Sharing is not only about doing good, it is also about being able to profit from a lot more. Young people don’t necessarily feel the need to possess things and to have them for their own. They are not really interested in having a car as soon as possible, buying an apartment, owning several things that meant well-being and status in the past. The young generation uses public transport and car sharing, they rent an apartment and sub-rent it as soon as they are not home for a week or two. They buy clothes and share them with their friends, sometimes even before they themselves have worn them. They also swap things: ‘If I can borrow your camera equipment for my vacation, you can use my car while I am away…” A totally new way of trading and possessing is being created. It comes down to the fact that everyone owns everything in a way. If you need it and you don’t have it, you just borrow it or swap it for a while. It’s also a way of earning while spending… While young people go on vacation they rent out their apartment. This way they earn at least half the money back they spent for their holidays… Seems smart! Admittedly a kind of mind change is needed, if we as the older generation want to start living the way described. Owning and possessing needs to be redefined in our understanding. The thought of achieving a certain level of wealth in order to be able to buy things and then enjoy them, use them and keep them only for ourselves is not a fit in this game. Nowadays things are not cherished anymore the way the older generation does. Maybe that is a result of a world of affluence which is pretty all our young people know. Good for them! And good for us, as we can learn from them to look at the world from another perspective. So keep on sharing! Make sure you provide your environment with interesting information and all you think could be valuable for others. Sharing makes you feel good and you build a great reputation for yourself. And in the end – who knows – in a way you will even profit yourself from it….